I’m a housewife with four grown children and grandchildren. We used to ranch in South Dakota, but now we are “city” folk. Because I like to study God’s word, I thought using a blog would be a neat way to express some of my thoughts about what I have studied over the years. It should be a good way to share and organize my thoughts at the same time. Because I want this web site to just glorify God and the salvation He offers to all of us, I won’t be debating anyone’s doctrinal beliefs or holding discussions on various subjects. This web site is simply a quiet time to consider various verses in God’s word. I would sure like to have you join me and will try to write a bit each day for you. The links on the right hand side of the “Hallelujah!” blog are devotionals I have written over the past few years. They have been posted in the past on another web site that does not keep an archive, so I thought I would share them with you here. Some of these sidebar links show a bit more about me — just the things that make life interesting. Hope you enjoy it all and visit as you are able. Thank you for stopping by. 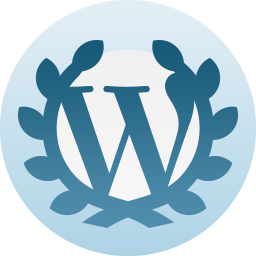 The above icon was in a “Happy 4th Anniversary” notice from WordPress. I have been posting devotionals to this site every day for four years now. Anyone who wishes is welcome to read any of these posts. They may be reached by using the calendar in the right-hand column. A drop down box will make all the years and months available. After choosing one of those, go again to the calendar in the right-hand column and click on a day of the month. That will take you to the post for the day you chose. Another option is to click on one of the “Tags” listed in the right-hand column. That will take you to devotionals tagged with that word. A third option is to use the search box in the right-hand column and type in a word that you think I might have written about. That will take you to the latest post title containing that word. All of these options are somewhat cumbersome. All-in-all, it’s good to think about what God says to us. Thank you, Ralph. Have a great day in the Lord. Thank you Margaret. Your reflections have great worth to you and to many more through your blog. How great is it to have wisdom and to be able to share it through this wonderful medium? Wisdom is knowledge applied. After living as long as you have, encountering both the bitter and the sweet of life, all while feasting on the Word to give you direction and perspective, you have arrived, at length, at the possession of some wisdom. Thank you for sharing it with those of us who aspire to this same precious gift. I hope you realize now, as you certainly will in the hereafter, the infinite worth and potential that you possess as a daughter of God. As man is, God once was. As God is, man may become through faith, obedience and the atoning blood of Christ. This is the potential that we all possess as children of a divine father. As a fellow traveler here below, I wish you blessings of continued wisdom and the strength to persevere in the faith until you return again to our heavenly home. I hope to be fortunate enough to see and know you there at the foot of the Master. Thank you for stopping by… I deeply appreciate the fact that God has given us His eternal word in the Bible, so that all may have the opportunity to come to know Him… If anyone sees wisdom in my writing, it is only because what I have gained from God’s word is to be able to see rightly that the LORD God Almighty is the one and only God… God’s word repeatedly, in many different ways, testifies to us that there is no other real Lord or God… People will “lord” it over one another to assert their position in life, but that does not make them a real Lord or God. I see that you are a Mormon… I am not… So, I’m not sure in what way you felt my writing has wisdom… I do not imagine that God was ever a man of any sort because the Bible tells us that God has always been God and that there is no other… The LORD God has no beginning or end… He is eternal… And, that is a real blessing for us because we don’t have to be concerned about any other authority… Neither do I imagine that any man will ever become as God is because God’s word tells us that we will serve the LORD our Savior through all eternity… He alone is LORD of lords, God of gods and King of kings. When you come to see, and fully accept, all God’s truths by studying His word to us, you will have a saving faith that will wondrously open heavens door for you… I pray that that day would be soon, so that you may come to know the blessed gifts of forgiveness and full justification through faith in the merits of Christ Jesus. We are a creation of God Almighty… Here today, and altogether too soon, gone tomorrow… It’s so important to spend this short life in God’s truths… I hope you will find the true life that our Savior desires for us. I found your blog the other day when I was working on my Bible Study. Just wanted to thank you for your devotionals they are so encouraging. I’m gonna bookmark you so your studies will be a part of my daily devotions. I’m so glad you find this site encouraging. All of God’s word to us in the Bible is encouragement, from beginning to end, as it reveals His faithful love and forgiveness for all who put their trust in Him. On the right hand column of this blog is a link to a post entitled, “Solving Life’s Problems“. You might find it interesting, as it describes a bit about my earlier Bible studies many years ago. God is fully able and willing to draw us near to Him in all sorts of ways when we desire to know Him. May all of your Bible studies be blessed. And, may God richly bless your study of His word. God bless you and may God give you many more years of blessings.. Thank you for stopping by… It is good to know that God’s children live throughout this whole world to serve Him in so many varied ways… May your every day be for our LORD. Margaret, Here I am middle of the night listening to Leonard Cohen Hallelujah deciding to look up the word. I found this down the list of sites to visit concerning the word. Praise the Lord and Hallelujah! What a pleasant and wonderful gift to find this blog. I do not blog have never been much of a writer. I have bookmarked your lovely words of Faith and Love for our dear Lord and Savior. What an unexpected treat. Thank you dear sister, I pray we meet one day, would love to sit and chat, sing some praises just spend some time. From what I have gathered, thinking about what should be our heart’s song in the “Hallelujah!” in God’s word — and the other “hallelujah” in some lyrics of today — there are a lot of differences……. Leonard Cohen first wrote lyrics to a song he entitled “Hallelujah!” in 1984… His usage of this word meaning “Praise the LORD!” is, frankly, very irreverent… I saved, from the internet, what seem to be his lyrics and see that they seem to be mixing up the story of David and Bathsheba with the story of Delilah… Whatever… he is seeming to be giving praise for human feelings in illicit exploits… That is disturbing, to say the least. The bottom line, as I’m sure you know, is that every single one of us is responsible for how we use God’s word… Since “Hallelujah!” means “Praise the LORD”, it should just be joyfully and reverently used for that purpose — and not in a worldly, or careless way. A cup of coffee would be good while sitting and chatting on oh so many subjects… Hope you have a great day! Prayers for you dear sweet lady! I was reading Ephesians 4 & Proverbs 30 this morning. I think the Apostle Paul PRAISES our Saviour with uncontainable JOY (e.g., Eph. 4:7-10 = Proverbs 30:4). As I rejoiced I asked the Holy Spirit if He’d like to see what Margaret’s devotion is today, but your wrist needs surgery! You are in His hands, rest & get better soon! It is good to take this time to rest in the Lord. I just stumbled across your blog while searching for something related and found it to be very encouraging. Thank you for letting the Lord use you in such a way. It is a blessing. Time flies by so fast that we need to appreciate and treasure the present. Give your little one a hug. Hi Margaret, my name is Busi and I was happy to come across your site…… I would like to refer on the post you made teaching about the Queen of Sheba and the people of Nineveh on their reaction on judgement day. Many teachers are running away from this verse that the Queen of the South will stand up and accuse this generation……. my Zulu beliefs…… Jesus is saying on Luke 11 verse 31 that the Queen of the South will stand up and accuse this generation…..
Heb. id. A kingdom in Arabia Felix… Sheba, in fact, was Saba in Southern Arabia, the Sabaeans of classical geography, who carried on the trade in spices with the other peoples of the ancient world… They were Semites, speaking one of the two main dialects of Himyaritic or South Arabic… Sheba had become a monarchy before the days of Solomon… Its queen brought him gold, spices, and precious stones ( 1 Kings 10:1-13 )… She is called by our Lord the “queen of the south” ( Matthew 12:42 ). When the Queen of Sheba arises to condemn the generation of unbelievers in Jesus’ time, she will be the actual queen who visited Solomon… She will condemn the unbelievers who listened to Jesus Christ preach, and the unbelievers of today — because in her life on earth, she came to believe in the LORD God Almighty only by listening to Solomon’s wisdom… He was a mere man… But, Jesus is God Almighty, come to redeem us from our sins… If we refuse to believe in Jesus as our Lord and God, and trust only in His suffering, death, and resurrection to pay for all our sins, then we will be condemned by the Queen of Sheba and the people of Nineveh. The people of Nineveh had been living very wicked lives — but, when a mere man, Jonah, preached to them, they repented and believed in God Almighty… So, Jesus pointed out that the people of Nineveh will judge those who refuse to trust in Jesus only… The people who heard Jesus saw all His miracles and heard the gospel, but refused to repent of their sins… That will lead the people of Nineveh to judge them for their unbelief. God has already done many wonderful things to help us believe and trust in Him alone… Therefore, it is very evil to refuse to believe in salvation through faith in Jesus alone… Only those who put their whole trust in Jesus only will get to heaven. That’s what Jesus was saying to the people… I hope this helps you understand what my post on the Queen of Sheba said. Blessings today! Thanks so much for your gracious words. Blessed by your posts! May God continue to you, your family, and ministry! And, thank you also for your word. Let us always pay close attention to God’s words, and never allow the world to harden our hearts, as so many in this world have. They don’t even realize how much they are becoming like Egypt’s Pharaoh. Thank you for being a faithful reader. Yes, God alone is in control of absolutely all things. From the beginning, there have been those who gladly listen to God’s word and take all of it to heart — to the saving of their souls. And, there are those who want to add to God’s word and take away from it. We will all have to face the LORD in the end and give an account. Thanks for stopping by my blog, which helped me to come across yours. Am glad that I had made the stop-by, cuz am gonna follow. Am enjoying your blog already! Have a wonderful Spring day!